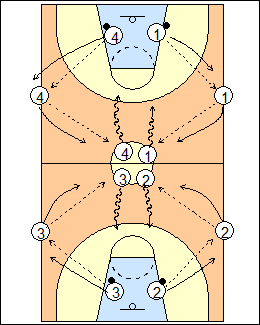 Four teams, each team has one ball and a player in the centre circle who gets a pass from a teammate on the sideline and dribbles for a shot (or layup), the passer follows the pass and is the next shooter. Shooters rebound, outlet to their sideline, and follow their passes, continue. Compete for makes or time. Augie Johnston - dribble into a wing pick and roll. 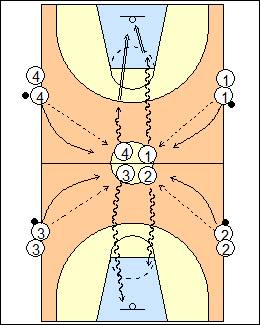 See Shooting - 31, Fast-break, Hubie Brown off the dribble, Guard workout, Altizer challenge, Noah Basketball.